Lovely views of both sea and mountains from super balcony. The location of Marina Mariola is perfect--it couldn't be any closer to the beach. The pool and facilities were excellent. The gym was a bonus! The apartment was spacious and extremely comfortable. The wifi was great as was the location. The pool was fantastic with sea views. We only wished we could have stayed longer. Patricia was a wonderful host. Thank you. Beautiful clean apartment with amazing views and very quiet. Perfect. The apartment was absolutely beautiful with a balcony overlooking the Mediterranean. Large and spacious and the beds/pillows were super comfortable. Walking distance to good restaurants and right on the beach. excellent location right on the beach - facilities such as the pool were excellent also. Nice apartment in a decent building. Nice crews. Big room with functional facilities. Close to the beach. Beautiful sunrise. Die Aussicht ist traumhaft. Der Pool ist echt super zum Schwimmen geeignet. Das mondäne Foyer macht einen tollen Eindruck. Lock in a great price for Marina Mariola – rated 8.7 by recent guests! 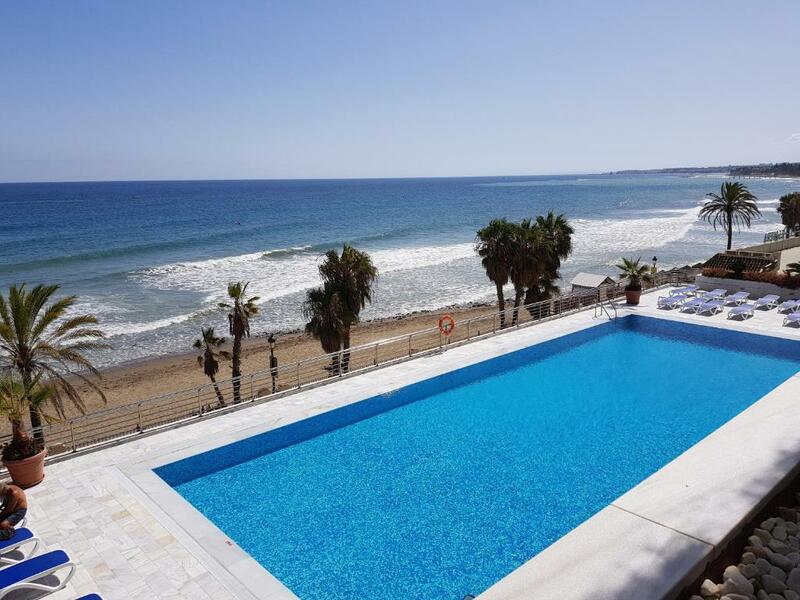 One of our top picks in Marbella.Set on the beachfront at Marbella Beach, the air-conditioned apartments at Marina Mariola come with free WiFi. The complex has a shared seasonal outdoor pool and hot tub. All apartments have a balcony or terrace, some with sea views. They each include a living room with a flat-screen TV and a kitchen with a microwave, oven, dishwasher and washing machine. The center of Marbella is a 20-minute walk away and offers a wide range of bars, restaurants and shops. Marbella Port is 15 minutes’ walk from the apartments. Puerto Banus can be reached in a 15-minute drive. Malaga and its airport are just under an hour’s drive from Marina Mariola. 뀐 Located in the top-rated area in Marbella, this property has an excellent location score of 9.4! When would you like to stay at Marina Mariola? This apartment has a dishwasher, electric kettle and sofa. House Rules Marina Mariola takes special requests – add in the next step! Marina Mariola accepts these cards and reserves the right to temporarily hold an amount prior to arrival. Please note that pets under 10 kg are allowed under request. Please note that guests will be charged for the remaining amount of the reservation upon arrival. Cash is preferred, but credit cards are also accepted. Please note that the swimming pool is only available from May to October. Expensive if not serviced ..
We were not told swimming pool was out of order and kids were disappointed. AirCon vents smelled of cigarette smoke..may be coming from another flat. WiFi did not work at all. Electric shut down for no reason at one night when we just went back. Hot water can only support one bath per night, need to wait till next morning for enough hot water for the next bath....but no problem for just taking showers. There was a click in the main bedroom that happened all day and night and seemed to be coming from behind the bedroom wall. It didn't stop me from getting to sleep, but I just couldn't figure out what it was! Everything is access controlled -so for a family who is constantly on the move, going in and out, it seems a bit too much, but we understand that there are benefits to access control. The communication with the rep was poor - had to wait nearly an hour for them to turn up and get the keys. not ideal when you have had a 2.00 am start. Great location , great apartment !